Representing the resilience and fidelity of Vietnamese Catholics, Cardinal Thuan’s life reminds Christians everywhere to proclaim the Gospel in all circumstances. On July 5, 2013, jubilant Vietnamese Catholics celebrated the closing of the diocesan phase of Cardinal Francis Xavier Nguyen Van Thuan’s beatification process. Although he is not yet canonized, the Vietnamese faithful already consider him a saint and view him as an icon of the Vietnamese Church. As a second-generation Vietnamese American Catholic, I did not realize the beauty of my heritage until I became acquainted with Cardinal Thuan while I was a postulant in my religious community. 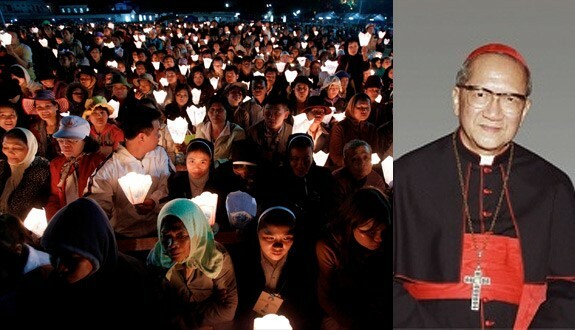 Cardinal Thuan, being a man of faith, hope, and charity, epitomizes the virtues of past and present Vietnamese Catholics and is a model for Christians around the world. Cardinal Nguyen Van Thuan was born on April 17, 1928, and from a young age, his character was shaped by the ideals of his heritage. He knew that he was called to communicate the best of Vietnamese culture. In 1941, he joined the Catholic seminary and was ordained a priest in 1953. Shortly after he was made coadjutor archbishop of Saigon in 1975, he was arrested and imprisoned by the Communists because of his Catholic faith. After 13 years of imprisonment, nine of which were spent in solitary confinement, then-Archbishop Thuan was released on the Feast of the Presentation of Our Lady. While in prison, he manifested the virtues cherished by Vietnamese Catholics. These virtues, however, do not only resonate in his life but also resound in the past and present Vietnamese faithful. One of the prized virtues of the Vietnamese martyrs is fidelity to Christ, even in the midst of profound hardship. Because rulers feared that Christianity would threaten the established order, Vietnamese kings and emperors persecuted Catholics intermittently from 1644 to 1888. Two hundred and forty-four years of interspersed persecutions bore fruit in the martyrdom of 150,000 (see Miracle of Hope by Andre Van Chau Nguyen, 10). When the Communist government began harassing Catholics less than 100 years later, Catholics continued to witness to Christ crucified. Vietnamese Catholics were not only steadfast but often innovative and proactive in their faith. In his book All Honor to You: The Journey of Faith Toward Life and Love, Father Peter Quang recounts his own heroic story, telling how he escaped from Vietnam on a boat in hopes of studying for the priesthood. Pirate raids, unskilled navigators, and cramped conditions were the norm for the Vietnamese boat people. Father Peter had almost no chance of making it to the United States safely, but a very real chance of being plundered by Communists or pirates; yet, he was willing to leave his beloved homeland and risk torture and death in order to answer the call to the priesthood. Following in the footsteps of the martyrs before him, Father Peter risked everything to serve the Lord—his faith was not reactive but proactive. The creative fidelity found in the martyrs and in those who, like Father Peter, fled Vietnam to pursue their vocation, permeated Archbishop Thuan’s actions during his imprisonment. He used his limited resources creatively in order to fulfill his duties as shepherd to the faithful when he was in prison. When he could not physically be present to his people, he solicited the help of a young boy to bring him old calendars. He wrote simple, sincere messages of hope on the calendars and had the young boy copy and distribute them among the faithful. His profound letters to the Catholic community strengthened them in their faith and helped them to persevere. The words, which resonated in the people’s hearts, reminded them that their beloved archbishop, though not physically present, was present with them through prayer. Archbishop Thuan, manifesting innovative fidelity, also used his scanty means to celebrate Mass in prison. He knew that celebrating Mass was his most important duty, but he had no church, no altar, and no tabernacle. How, then, could he fulfill his duty as bishop? He turned the concentration camp into a cathedral and the palm of his hand into an altar. He turned his shirt pocket into a tabernacle and turned the darkness of the sleeping quarters into a dwelling place for Light Himself. Because of his ingenuity, many prisoners regained the fervor of their faith. The prisoners were reminded to embrace suffering and to use their current circumstances to grow in faith. His example not only embodies the proactive faith of past and present Vietnamese Catholics but also teaches all Christians that faith entails an active surrender to the Lord. It means seeking the best way to proclaim Christ’s love in every moment, every circumstance, and every action. Vietnamese Catholics are a people of hope. They endure profound suffering and poverty because their hope is in heaven. In 1860, Emperor Tu Duc attempted to demolish Catholicism by splitting up Catholic families (Miracle of Hope, 10). This failed because Christians persevered during that period with courage and resilience. Though it seemed that they lost everything, Catholics recognized they had nothing to lose because their hope was in the risen Christ. About 150 years later, Vietnamese Catholics are still perpetuating the enduring hope that characterizes their past. After entering the convent, I met two sisters from Vietnam. There, they are kept under tight surveillance by the government and cannot openly teach the faith. From an earthly standpoint, it may seem that their mission is futile and useless. They, however, view all things from the supernatural perspective. These sisters, continuing the heritage of hope, recognize that if they place their hope in the Lord, nothing is lost and everything is gained. Archbishop Thuan, while in prison, literally had nothing to give to his faithful. He could not give his time, energy, or advice. He became like the widow from the gospels who only gave two copper coins (Luke 21:1-4). However, like the widow, he also gave all he had; he offered his emptiness and suffering as a prayer to God the Father. During his imprisonment, Archbishop Thuan learned to no longer place his hope in his works but to place his hope in accepting God’s plan for him. Community-minded charity is the driving force behind Vietnamese Catholics’ actions. In Vietnam, the focus is not on the individual but on placing the well-being of one’s neighbor above one’s own. This is especially seen in Cardinal Thuan’s ancestors, who were also persecuted for the faith. His great-great-grandfather Danh was separated from the family and ordered to work as an unpaid laborer. Sick and emaciated, Danh’s chances of dying of starvation were high. His son Vong, after hearing about his father’s sufferings, asked his landlord’s permission to bring food for his father even though his own rations were meager. Every morning, Vong cooked his portion of rice, delivered half of it to his father, and ran six miles back to the rice field in order to begin work at sunrise (Miracle of Hope, 11). It was because of Vong that Danh survived. Vong’s charity prolonged Danh’s life and renewed his hope. It is this same attentiveness that characterizes current Vietnamese Church ladies. They sacrifice their time, money, and sleep in order to spread the Gospel to hungry souls. Their limitless charity leads them to anticipating others’ needs and using any meager resources they have to help. Exemplifying the Vietnamese tendency to be attentive to others, otherwise known as “charitable nosiness,” Archbishop Thuan was conscientious of his prison guards’ needs. Formed in all the goodness of Vietnam’s communal culture, he could not help but intrude on the prison guards’ lives. He saw them as part of the village in which he lived—he saw them as family. Eventually, Archbishop’s Thuan kind demeanor and genuine interest pierced through their anxiety and resentment. He taught them English, French, Latin, and other foreign languages. Starving for a sense of meaning in their lives, the prison guards would ask him numerous questions about the Church. The archbishop catechized his eager students, explaining Catholic doctrine with kindness and patience. When the prison guards asked if he felt resentment towards them for his imprisonment, he only assured them of his concern and love for them (Five Loaves and Two Fish, 56). His love was both bewildering and contagious. Government officials soon discovered prison guards questioning Communist ideals and singing the Veni Sancte Spiritus while working. As a result, government officials were constantly changing Archbishop Thuan’s prison guards because Christian ideals were infecting die-hard Communists, but by the time the guards were moved away, the saintly prisoner had already imprinted his ideals in their hearts. Like the persecuted Catholics that preceded him, Cardinal Thuan’s charity shows that only Christian love can bring about positive change. It is when one loves without boundaries that one brings forth new life. Cardinal Nguyen Van Thuan carried the Vietnamese Catholic ideals with him wherever he went. The best of the Vietnamese Catholicism is marked by the people’s innovative faith, enduring hope, and boundless charity. Cardinal Thuan is not only a paradigm of the Vietnamese Church, but his witness teaches and reminds all Christians to proclaim Christ’s love vibrantly in all circumstances. He shows us what it means to surrender everything in order to find the pearl of great price (Matthew 13:45-46). Nguyen, Andre Van Chau. The Miracle of Hope. Boston: Pauline Books & Media, 2003. Nguyen, Cardinal Van Thuan. Five Loaves and Two Fish. Vancouver: Lavamis Publishings, 2000. Nguyen, Father Peter Quang. All Honor to You: The Journey of Faith toward Life and Love. Ink & Scribe, 2002. Sr. Maria Thuan Nguyen is a member of the Dominican Sisters of St. Cecilia. She received her Masters of Arts in Teaching at Aquinas College in Nashville, TN and currently teaches at Bishop Machebeuf High School in Denver.